Today’s persistently high unemployment rate affects not only those who have lost or are without jobs but also their family members, including their children. 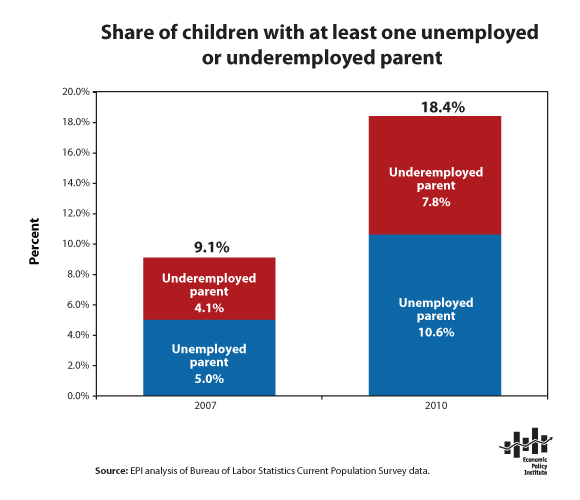 The figure shows that the share of children living with an unemployed or underemployed parent rose from 9.1 percent (6.4 million) in 2007 to 18.3 percent (13.0 million) in 2010. One in four children in black and Hispanic families had an unemployed or underemployed parent in 2010. One takeaway from this analysis is that children experience a higher “unemployment rate” than that confronting the average worker. In 2010, when the national unemployment rate was 9.6 percent, 10.6 percent of children had an unemployed parent. Similarly, 18.3 percent of children had an under- or unemployed parent, which exceeded the national underemployment rate of 16.8 percent.